Your appointment in our department has been requested by your referring physician. Your referring physician will arrange for pre-authorization for the consultation and this will be verified by our staff. 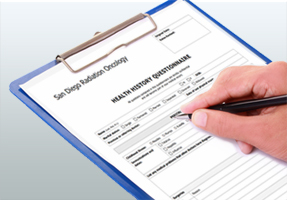 Prior to arriving for your initial consultation your records including imaging studies, pathology reports, pertinent studies, and hospital reports will be sent to us for evaluation by your referring physicians. If you are self-referring, you may be asked to provide these materials to our clinic prior to your scheduled visit. Your treatment process starts with a very thorough evaluation of your past and present medical history and a physical exam. During your consultation you will be given information on the role of radiation in the treatment of your particular cancer as well as a thorough discussion of the risks, benefits, and side effects of treatment. If additional studies are required prior to making treatment recommendations, these will be discussed with you during the consultation. If no additional studies are required, you should have an understanding of what your treatment plan will be, approximately how many days of treatment, and what side effects to expect as you go through treatment and afterwards by the completion of your consultation. Please download, print, and complete the following forms prior to your visit. Please bring all the completed forms to your appointment with us. Forms require free Adobe Reader - download here if needed.